Coach Mark Green (front left) poses with his team after a recent tennis tournament. PV will be at the OKC Tennis Center on Saturday for the Pauls Valley Invitational. 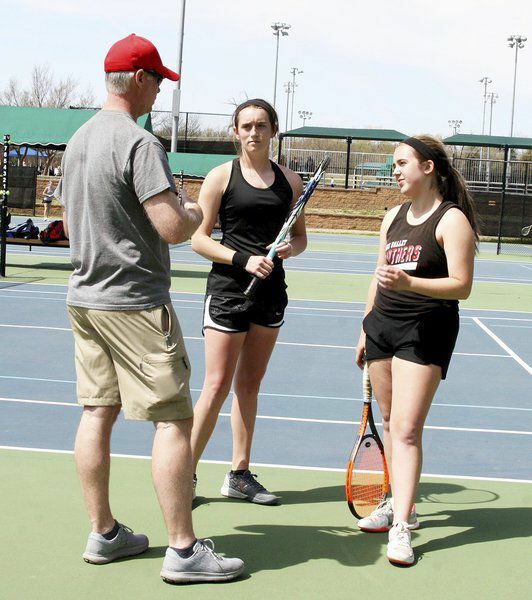 Cameron Freeland and Macey Bonner talk with coach Mark Green during a recent tournament. The one doubles team of Matthew Tice and Wyatt Cummings show off their first-place medals after a win this season. Kim Nunez returns a shot during recent action for the Pauls Valley Lady Panthers tennis team. The girls one doubles team of Junior Cameron Freeland and Sophomore Macey Bonner is proving to be one of the top 4A teams in the state having won their last two tournaments. Bonner and Freeland were both state qualifiers last year in singles but were put together this year to make a strong one doubles team that has already beaten some of the best 4A teams in the state. Highlights of their season thus far include championship wins against Byng in the 4A Classic tournament in Oklahoma City and a 6-3 6-0 victory over a highly rated Crossings Christian team this past week. Having not played together before this year, they are showing improvement every week. The returning boys one doubles team of Matthew Tice and Wyatt Cummings continue to capture tournament wins having brought home three titles thus far in 2019. Their most impressive victory was a 7-5 7-5 championship win over perennial 5A powerhouse Duncan at their own tournament. The senior team of Tice and Cummings are the returning State fifth-place finisher and hope to improve on that placement this year. Coach Mark Green has been shuffling other players around during the first half of the season to see what the best lineup will turn out to be. In girls, the senior two doubles team of Julia Beddow and Kendall Readnour have seen success with a third-place finish and a couple of fifth-place finishes thus far in the season. It looks like Jazmin Diaz has found the spot at one singles, and Kim Nuñez is playing two singles. At the Lawton tournament, there was a rarely seen three doubles bracket. Pauls Valley seniors Bryssa Atkins and Aja Cranford captured the second-place medal at that tournament. Caleb Henley is winning matches in two singles. Neiko Assad and Josiah Medina finished third in three doubles at the Lawton tournament. The Panthers continue their season this Saturday, April 13th at the Pauls Valley Invitational in Oklahoma City Tennis Center.